The October issue of CQ takes us on a voyage through time as well as space. We start out with a DXpedition to a "country" in the middle of New York City -- a visit to 4U1UN, the amateur station at United Nations Headquarters. Then we take you back to 1942, with plans for building a working model of a fictional radio, Captain Midnight's "Pocket Locator." Co-authors Leonard Zane and Tooru Kawabata bring this "top secret" transceiver to life as a 10-meter QRP rig! 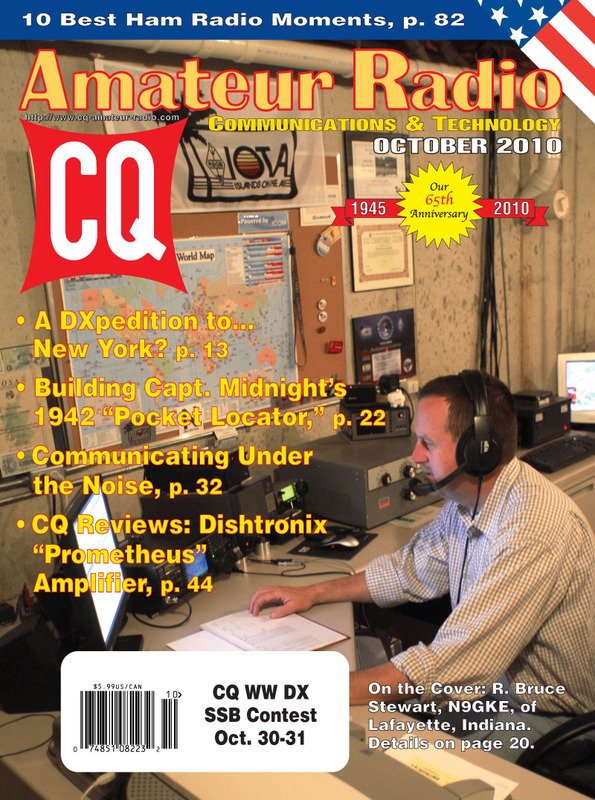 Moving to the present day, co-authors David Witkowski, W6DTW, and CQ Propagation Editor Tomas Hood, NW7US, introduce us to JT-65 -- a mode best-known for moonbounce -- gaining popularity on the amateur HF bands. Next, we have our annual update of the CQ World Wide DX Contest All-Time Records, compiled by Fred Capossela, K6SSS; Gordon West, WB6NOA, gives us a mini-review of etched, lighted, callsign plaques made by KF4NBG; and Steve Bolia, N8BJQ, has a full review of the DX-2400L1 "Prometheus" amplifier from Dishtronix. Among our columns for this issue, "Math's Notes" editor Irwin Math, WA2NDM, finishes his primer on fiber-optics; "Washington Readout" editor Fred Maia, W5YI, looks at the court ruling that struck down the FCC's indecency policy and how that might affect ham radio enforcement; Public Service Editor Richard Fisher, KI6SN, looks at advancing digital technology in emergency communications, specifically "N-Beams," or Narrow Band Emergency Messaging System; and Digital Editor Don Rotolo, N2IRZ, reviews internet security and passwords, necessary knowledge as ham radio and the internet become ever-more intertwined. Kit-Building Editor Joe Eisenberg, K0NEB, discusses parts placement when constructing a kit, and looks at the "Handi-Hunter" foxhunting receiver kit; QRP Editor Cam Hartford, N6GA, takes us hilltopping for Summits on the Air (SOTA) activity, then down to Arizona for the "Four Days in Rain" QRP gathering in Ft. Tuthill. "Magic in the Sky" columnist Jeff Reinhardt, AA6JR, offers up his take on "The Ten Best Ham Radio Moments," and New Products Editor John Wood, WV5J, looks at some goodies that will extend "your human capabilities." 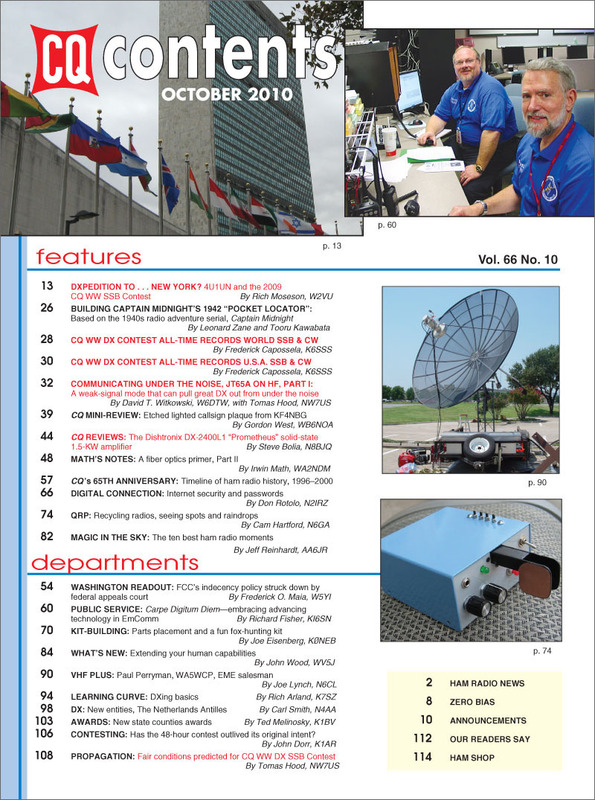 "VHF-Plus" editor Joe Lynch, N6CL, reports on "parking-lot moonbounce," as provided by EME "salesman" Paul Perryman, WA5WCP; "Learning Curve" editor Rich Arland, K7SZ, covers DXing basics; DX Editor Carl Smith, N4AA, previews DXpeditions to the new "entities" that will be created in October when the Netherlands Antilles become self-governing, and Awards Editor Ted Melinosky, K1BV, updates us on some new state-level counties awards. 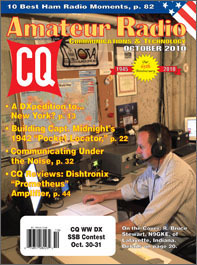 Finally, Contesting Editor John Dorr, K1AR, wonders aloud whether the 48-hour contest has outlived its original intent, and Propagation Editor Tomas Hood, NW7US, predicts fair band conditions for the SSB weekend of the CQ World Wide DX Contest in late October. That's a brief look at what's coming up in the October issue of CQ magazine, which should be on newsstands and in subscribers' mailboxes by late September. For information on becoming a CQ subscriber, click here. Coming soon: 2011-2012 CQ Calendars! Click here to order your advance copy now! On the Cover: Island-hunter R. Bruce Stewart, N9GKE, of Lafayette, Indiana.